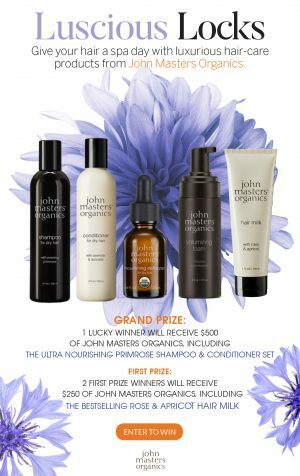 Interactive Wellness Group and John Masters Haircare, present the; Luscious Locks Giveaway. These Official Rules govern Interactive Wellness Group, LLC.’s “Luscious Locks Giveaway” (the “Giveaway”). Interactive Wellness Group, LLC. (“IWG”) may be referred to below as the “Sponsor”. 1. ENTRY PROCESS – To enter the Giveaway, you (“You” or the “Entrant”) must go to http://www.spaweek.com/giveaway/hairmasters-s19 and follow the on-screen entry instructions. By submitting an entry, You confirm Your understanding and acceptance of these Official Rules. Also, by submitting an entry, You expressly agree to be bound by the terms and conditions contained in these Official Rules. Also, by submitting an entry, You expressly agree to receive email notifications and news from IWG and John Masters Haircare. In addition, by submitting an entry, You expressly grant authority to the Sponsor and all of its respective past, present, and future parents, subsidiaries, divisions, affiliates, predecessors, successors, transferees, and assigns, to use Your name, address (city and state only), likeness, and/ or voice in any manner and in any and all media now or hereafter known throughout the world in perpetuity without further approval by, or notification or compensation to, You, unless prohibited by law, in the event that You win a Prize. The Sponsor is not responsible for lost, late, illegible, incomplete, stolen, or misdirected entries. In the event of a dispute, an entry will be deemed submitted by the authorized account holder of the e-mail address submitted at the time of entry. An “authorized account holder” is defined as the natural person who is assigned to an e-mail address by an Internet Access Provider, online service provider, or other organization (e.g., business, educational institute) that is responsible for assigning e-mail addresses for the domain associated with the submitted e-mail address. Only one (1) entry per person is permitted for this prize.